The long awaited RHPK Winter Cup finally arrived – what seemed like an eternity until the gates opened on a very cold Saturday Morning. Conditions were wet with light snow on and off throughout the day, temperatures of ~1c. 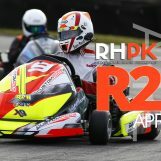 The Winter Cup is the first RHPK race in the year which is a completely standalone race. It does not count towards the 2017 Summer Series and is designed as a shakedown for new and regular teams before the start of the season. This year we had a number of changes to the format which included a well received One-lap shootout! This month we were joined by a number of new teams, APL Racing, JND Racing & Burton WAGs. 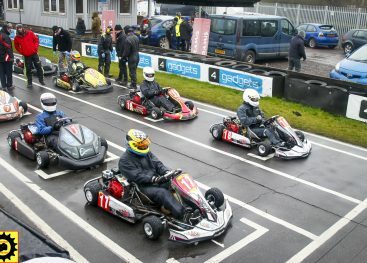 RPM Racing were once again back in force with two karts, RPM Racing 1 & 2. 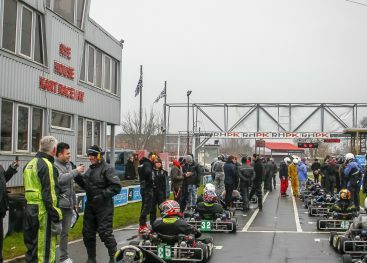 Despite a large number of regulars holding off until the start of the summer season, we had an all-time record of 21 Karts on the grid for the Winter Cup. 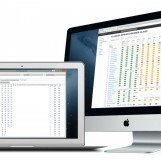 2016 saw 15 and 2015 – 12. 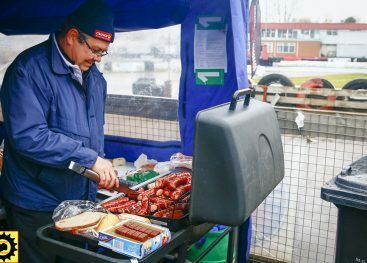 Thank you to everyone who braved the bitterly cold conditions. 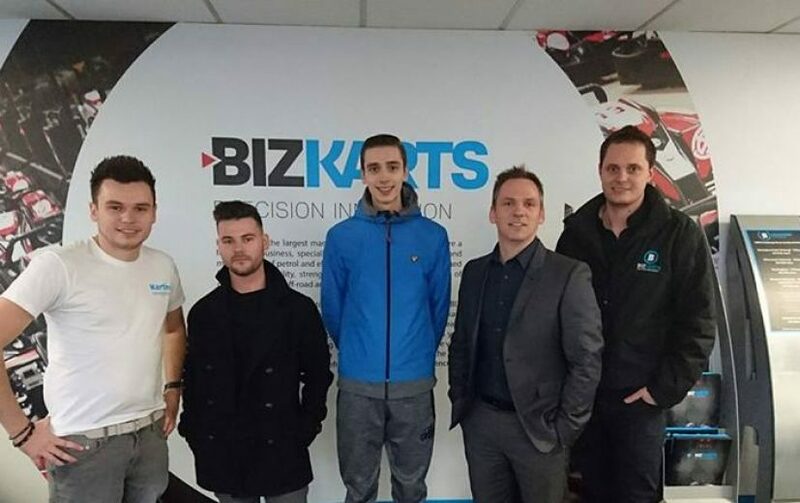 It was announced in the weeks leading up to the Winter Cup that the Karting Magazine driver line up for RHPK 2017 would look completely different. 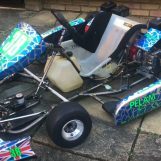 Matt England, Jack Ransom & Leigh Babbage heads up the 2017 team sponsored by Biz Karts and uFo Engines. This year we announced that qualifying would consist of a 1 lap shootout! no out lap, no warming up tyres – straight out past the start finish and your lap commenced! 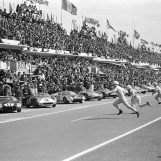 The order was picked at Random by teams which would then go on to place them on the grid for race 2. Team CET looked shocked at they pulled out the top spot, meaning they would qualify for Race 1 first and leading the pack in Race 2! Jaunius Zukas just about to start his hot lap. With only one driver putting in their hot lap on the track at once, all eyes were watching on track or the timing screen in anticipation as they drove past to complete their lap. All 21 drivers crossed the line without a spin or going off track – fantastic feat given the conditions and completely cold tyres! RPM Racing 1 and 2 lock out the front row of the grid. RPM1 almost a full second quicker than RPM 2. Helicopter Services find themselves on the second row alongside Titan Motorsport. Newly promoted Super team, Amigos looked very promising in the morning. Qualifying a very strong 6th place. 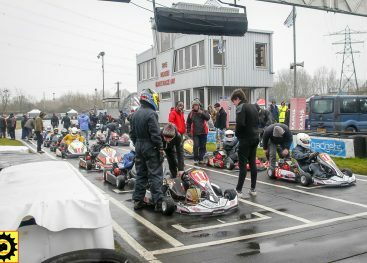 All eyes were on Team Karting Magazine who had next to no practice in the morning, however they were unable to find any grip or pace in their one lap – resulting in back of the pack for Race 1. In Clubman, the brand new team of JND Racing took the top spot with a 56.008. Artifex were just .200 off to take second and Burton Power WAGs took third spot, out qualifying Burton Power Racing. APL Racing, in their first RHPK race took a very respectable 4th place in Clubman. RPM 1 leads the pack into the first corner, Helicopter Services have the inside line over RPM 2 but lack of grip means Helicopter slide wide allowing RPM 2 and Titan to jump ahead. It looks close between Titan and Helicopter Services going into the second hairpin whilst Amigos clawing back spaces from Custom Rods and JND Racing. 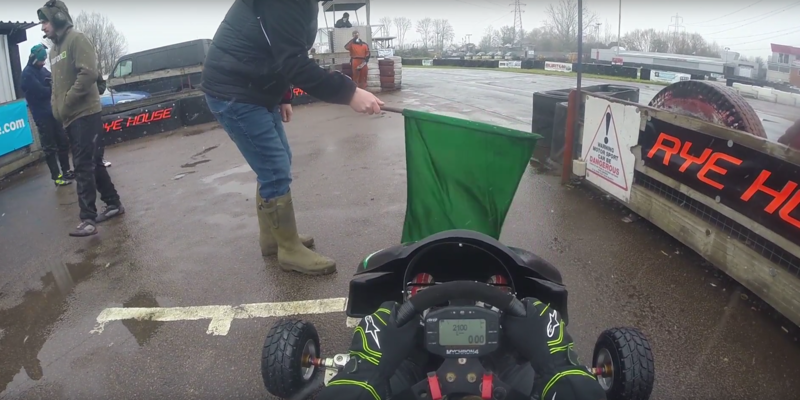 Highest mover on lap one is Team Karting Magazine, making up an incredible 10 places already in 11th place – their changes post qualifying making a big difference. Leading the Clubman pack is JND Racing over Burton Power WAGs and March Racing. Artifex dropping 8 places on lap 1. As the race gets underway RPM 1 & 2 lapping consistently quicker than 3rd place Titan Motorsport and Helicopter Services. Custom Rods having a spin lap early on lap 2, dropping a number of places to 15th. By lap 10 CET are 10th and soon go up to 8th after HRS losing 3 places. 15 Laps into the race and it appears RPM 2 are having issues with their steering forcing them to come into the pit for an unscheduled stop dropping them down to 16th place. They go on to charge through the pack. 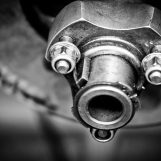 Disaster for Burton Power WAGs, who suffer a cracked chassis forcing them to retire. The newly promoted team Team Amigos seem to be getting quicker and quicker – mid-way through the race they are the quickest out there, trying to chase down the formidable RPM teams. Both March Racing and APL Racing in their first race looking strong and stronger as the track starts to dry. As the chequered flag drops RPM Racing take a 1st and second, Amigos take a well deserved 3rd place and Titan Motorsport take 4th. 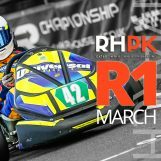 2016 RHPK Champions are in 5th place and Team Karting Magazine take 6th place. In Clubman, the brand new JND Racing take the win, March Racing take a well deserved 2nd place and Team CET take an incredible 3rd place! In their first race with RHPK, APL take 4th place – well done guys! As the teams lined up in their random positions for Race 2, Team CET were sitting proud on the front row of the grid next to Custom Rods. Helicopter Services were lined up 18th. The track was drying lap after lap in the 1st race. You could make out a dry line, a couple of teams – March Racing & HRS Racing daring to go on slicks. As the green flag dropped Custom Rods lead the field into the first corner. Pelam Racing have a spin on the apex of Stadium possibly a coming together with another team which causes a number of teams to be collected. The on-board fottage from Jaunius Zukas (JND Racing) reveals all ~4:02 minutes in. 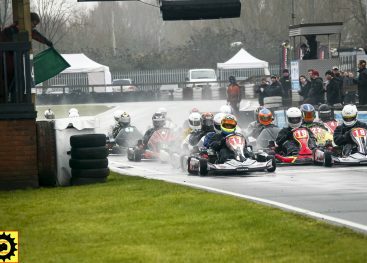 Pelam Racing, Artifex, Helicopter Services, RPM Racing 1, JND Racing & JAB Racing were all involved in the first corner incident. Highest mover on lap 1 is HRS 1, jumping 8th places! 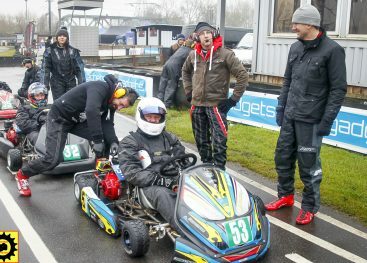 Team Karting Magazine are up to 5th place already. Lap 4 Titan Motorsport take CET, clubman front runners for 2nd place. Lap 12 and Polish Lambo are chasing down Team CET for the Clubman lead, followed closely by Burton Power Racing. 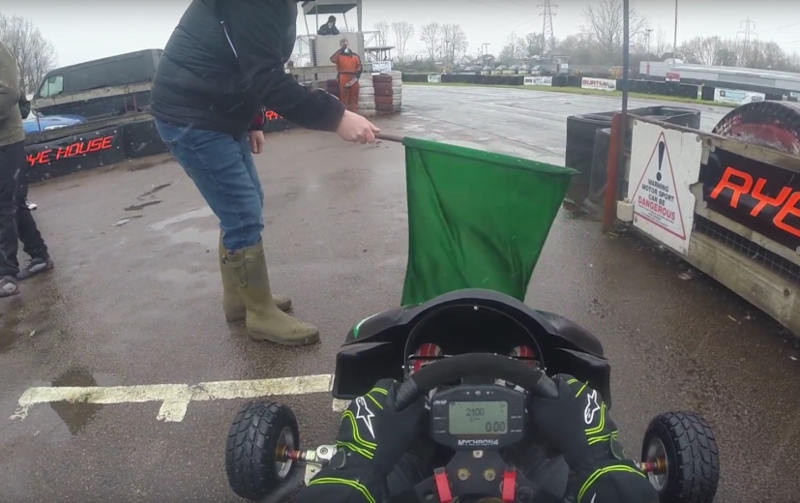 Lap 15 Team Karting Magazine put in the fastest lap of the race on a every drying track, they are now running 3rd. In Clubman Polish Lambo have the lead over Team Eyrie Also just 0.5 seconds behind! APL Racing, running 3rd in class. Lap 16 Team Karting Magazine take 2nd over Titan Motorsport, it looks a closely fought battle for 2nd. Lap 32 JAB Racing take the Clubman lead over Polish Lambo, JND Racing a pushing hard to come back up through the field after being caught up at the start, already now 9th. Just as the track was drying, both HRS and March getting quicker and quicker – starting to match the teams on wets, it started to rain. Custom Rods looked to be slowing down as the rain came down and RPM 2 chasing them down to take the lead on the 42nd lap. Amigos again looked very quick. Ed White was at the wheel for the team and were leading by lap 91! Unfortunately, they had to pit due to their front bumper and then suffered a rear puncture. With a number of teams tyres looking decidedly worn due to the drying conditions, pit stops were critical. JRH just one of a number of teams deciding to make a couple of tyre changes meaning they were mighty strong in the second half of the race. 15 minutes to go there was a closely fought battle between RPM 1 and Titan Motorsport, Titan managing to make the move stick to secure 2nd place for the team! 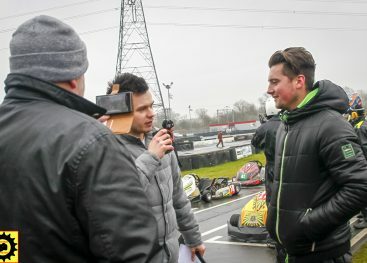 As the chequered flag dropped RPM 2 took the win, Titan Motorsport 2nd, RPM 1 3rd and Karting Magazine in with their brand new team took 4th place! In Clubman Polish Lambo took an incredible win, their first! followed closely by JND Racing and a well deserved 3rd place for Artifex Racing. HRS 2 took 4th place.